" My name is Nanette Hosking. I currently live with my husband and two children in Balwyn. Fitness and exercise has always been a big part of my life. I competed in athletics and tennis as I was growing up and now always make time each day to stay fit and healthy by either swimming, running, weight training or practicing yoga. 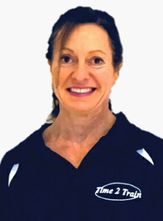 I come from a background of hospitality and sales and only recently decided to combine my passion and knowledge of food and exercise to complete a Personal Training course in order to help motivate and train others to improve their lives through exercise. Whilst completing the Personal Training course, I was fortunate to have been able to observe the work that Jeremy does with children on the autism spectrum. I am very excited by how much of a positive impact physical exercise can have on these children and how much improvement can be made by helping and supporting them through a program suited to each of their needs. Knowing I can help has given me a new direction and I am so looking forward to being able to make a difference to each of their lives. "